Shout! Factory is proud to present Live At McCabe's Guitar Shop, a new series featuring rare performances from acclaimed musicians and songwriters. On any given weekend, you can walk into Santa Monica's legendary McCabe's Guitar Shop and enjoy an evening of intimate storytelling from the best and most accomplished singer-songwriters around. For years, songwriters-both locals and touring musicians-have used McCabe's low-key, intimate vibe as a place to not only play their best-known songs unplugged, but also try out new material. 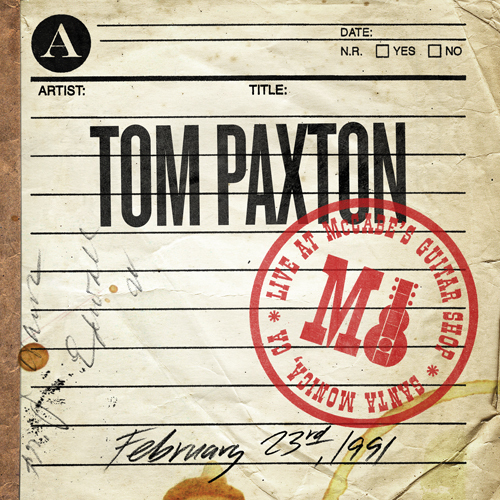 Tom Paxton started out in the Greenwich Village folk scene as a contemporary of such folk greats as Bob Dylan and Phil Ochs. Though he released a string of studio albums, he is best known for his live concerts and his songwriting. His biggest hit, "The Last Thing On My Mind," has been covered by Neil Diamond, Willie Nelson, Peter Paul & Mary, Joan Baez, Glen Campbell and countless others. Live at McCabe's Guitar Shop, recorded on February 23, 1991, contains his biggest hits and most-scathing political songs, including "The Last Thing On My Mind," "Bottle Of Wine," and "Yuppies In The Sky." 1 8 Did You Hear John Hurt?